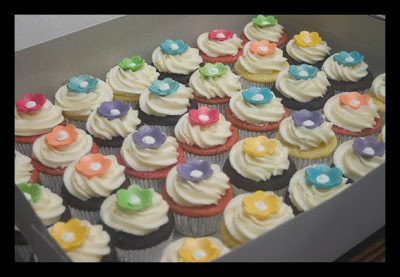 A whole bunch of cupcakes! If you haven't see me recently, this is why. I've been making 150 cupcakes and a cake for a surprise 50th birthday party for a neighbor. It was such an amazing party, at a resort up in Midway and the theme was hummingbirds. 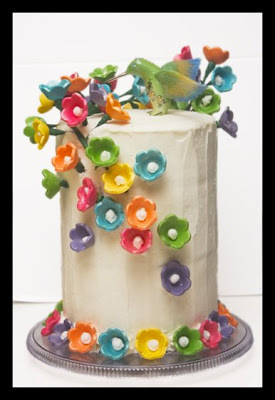 I did bright gumpaste flowers with cake shimmer on them for each cupcake and then put some on wires for the cake, which was a 6" round and about 10 inches high. I did lemon, strawberry and chocolate cake. They were delicious. I'm so glad I made my deadline and huge thanks to Melissa and Kathy Colton for helping me so much! Love you girls! Oh, Kara! That cake turned out amazing! I love the flowers twirling up the side like that! It is gorgeous! 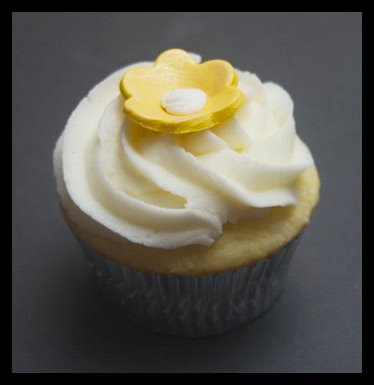 And I think I might need to sneak over again today to get another of those leftover cupcakes. YUM! It is gorgeous. Way too nice to cut into !! BEAUTIFUL girl! I saw Melissa at Archivers the other night and she said how much fun you girls had. I keep telling ya girl...you need to figure out opening your own little bakery somewhere. It would be a HUGE hit! WOW, Melissa told me about this, it's even more amazing seeing the pictures! You're so talented! We'll have to crop together next time, let me know when you do! Oh, yeah, you should open a bakery, I'd be there in an instant! These turned out beautifully, girl!